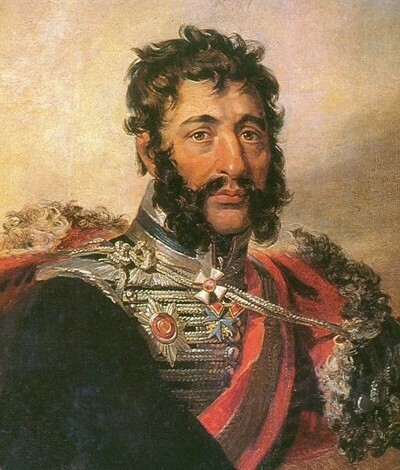 The major general Yakov Petrovich Kulnev (1763-1812), the gentleman of awards of St. Anna of the 1st degree, St. Georgy of the 3rd degree, St. Vladimir of the 3rd degree and Prussian "For merits", having the Gold saber with diamonds and the inscription "For Bravery", was born on July 22, 1763 in the city of Lyutsin of the Vitebsk province in a family of rather poor nobleman. In seven years of Yakov wrote down in Overland Shlyakhetny military school. For progress in study he was awarded by a big silver medal and in 1785 is released by the lieutenant in the Chernihiv infantry regiment. But the same year the young officer was transferred to the St. Petersburg dragoon regiment with which he took part in the Russian-Turkish war of 1787 - 1791. Already in the first fights, especially at a fortress siege Bender, Ya. P. Kulnev attracted attention desperate bravery and composure. After the conclusion of the Yassky world with Turkey it is translated in Pereyaslavsky horse egersky a regiment. As a part of the case of the general of B. F. Knorring the regiment participates in war with Poland near Oshmyanami, Lida and Vilno. The general-anshef A. V. Suvorov heading the Russian army in Poland noted outstanding abilities of the brave officer. Time of service under the administration And, Ya. P. Kulnev considered V. Suvorov the happiest in the life. It is directly involved in battles at Kobrin, Mukhovtsa and Brest-Litovske where courageous cavalry attack and a bayonet assault turned a battle outcome. Among caused a stir there was also Ya.P. Kulnev who was entitled the captain. On October 24, 1794 A. V. Suvorov's army stormed the suburb of Warsaw - fortress Prague. The cavalry covered the Russian guns following with reserves seven assault columns. When the infantry took control of a rampart, the cavalry rushed on streets of Prague. The captain Ya. P. Kulnev was one of the first. For this fight on November 7 it was awarded the major's ranks. After the end of the Polish campaign Ya.P. Kulneva translate in Sumy Hussars, and he within 10 years does not participate in campaigns. The melancholy and despondency seize it. He thinks of resignation. But in 1807 it is transferred to the Grodno Hussars. Ya.P. Kulnev receives a rank of a podyopolkovnik and together with a regiment participates in war with France. For courage in battles at Gutshtadt, Ankendorf and Passarge's river on May 24 - 25 he was awarded the order St. Vladimir the 4th degree with a bow, on May 29 participates in Geylsbergsky fight, and on June 2 in Fridlandsky battle. During one of attacks the Grodno regiment in the heat of fight broke so deeply that it was surrounded by French. Death or disgraceful captivity - such is there was a choice. But Ya. P. Kulnev with the hussars fearlessly rushed on the enemy and managed to break through through ranks of in number surpassing enemy. Stunned with such bravery, the enemy fell under blows of hussar sabers. Colonelcy and award St. Anna the 2nd degree was become an award for this feat. 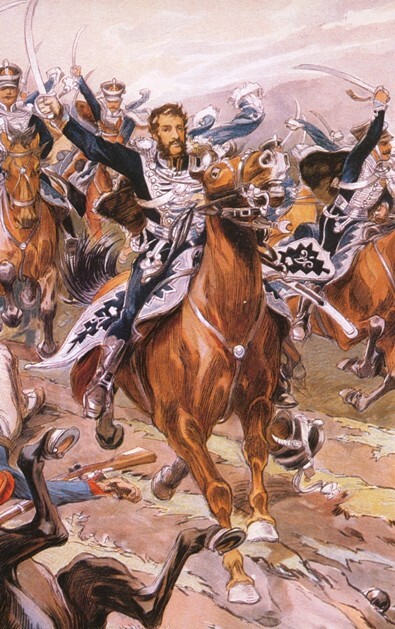 The name of Kulnev gains popularity in a cavalry of the Russian army. The Tilsit world finished this war with Napoleon. But in 1808 Russia enters war with Sweden for Finland. The colonel Ya.P. Kulnev with the Grodno hussars is given assignment in field army. He with pleasure speaks: "I love our mother Russia for the fact that at us always somewhere yes fight!". Three times during 1808 it passed Finland, ordering two times vanguard and once a rear guard of the Russian army, continuously battling, spending the night on camps, among snow or impassable bogs, is frequent without piece of bread. Bravery of the Russian hero admired and surprised even enemies. The commander of the Russian troops lieutenant general count N. M. Kamensky wanted to present it to assignment of a rank of the major general, but Ya. P. Kulnev asked to replace this representation with a gratuity. The emperor Alexander I awards the order to the brave hussar St. Georgy of the 3rd degree and 5 thousand rubles favor to him. Kulnev sends all money to the poor mother. He writes the brother Alexander: "For God a prayer, for the Sovereign the service will not be gone! What service was more unfortunate than mine? Now everything was changed also I the happiest of mortal the fate. It is better to be less winner on merits, than it is a lot of without any merits. With what grandee carrying Vladimir of the 1st class, porovnyayu I my Vladimir the 4th with a bow". The Finnish war does widely known a name of Kulnev. In December, 1808 to it the rank of the major general is given. He takes part in a campaign of the 17-thousand case of the prince P. I. Bagration to Stockholm. The Russian troops on ice of the Gulf of Finland through the island Kumling acted on February 26, 1809 as five colons to the Aland Islands and further to Sweden. Ya. P. Kulnev ordered vanguard of the column Stroganov's column bypassing Áland from the South with the purpose to cut retreat from them of Swedes. The campaign passed in very severe conditions - on the piled-up ice blocks, through snowdrifts and ice-holes. Having broken a rear guard of Swedes, having occupied artillery and more than 600 prisoners, the group of the major general Kulnev reached the coast of Sweden and seized the coastal town of Grisselgam. To Stockholm there were less than hundred versts. Sweden requested truces. The emperor Alexander I appreciated a feat of brave soldiers. The major general Kulnev was awarded the order St. Anna of the 1st degree, and all troops which were on the Swedish coast received on two rubles on the person and silver, on a blue tape, the medal "For Transition to the Swedish Coast". According to the peace treaty signed on September 5, 1809 with Sweden Russia got Finland and the Aland Islands. After completion of war with Sweden Ya. P. Kulnev is directed to the South where the fourth year there was the Russian-Turkish war of 1806 - 1812. He is appointed the chief of the Belarusian Hussars and heads vanguard of the Moldavian army of the general from an infanteriya the column H. M. Kamensk, participates in capture of fortresses of Silistria and Shuml. For battle at Batting to it the saber with diamonds and the inscription "For Bravery" complains. Soon after the Batinsky victory (in January, 1811) Ya. P. Kulnev is appointed the chief of the Grodno regiment which was settling down in the Vitebsk province. From the beginning of Patriotic war of 1812 this regiment is a part 1 - go the infantry case of the lieutenant general of the count P.Ch. Wittgenstein. The case acted on the right flank of 1 army and together with army receded through Vilkomir on Soloki. Ya. P. Kulnev is appointed to komanyodovat a case rear guard. Retreat passed across native places where his childhood proceeded, in continuous skirmishes with troops of the French marshal Oudinot who had a task to cut off the case of the count P.Ch. Wittgenstein from the 1st army and to crush it. However Oudinot's approach was slowed down by courageous and persistent deyyostviye of group of Ya. P. Kulnev that allowed the case of the count P.Ch. Wittgenstein it is organized to pass Sventa for the river, having left in Vilkomire only Ya. P. Kulnev's group. Eight hours it protected Vilkomir, then destroyed pave departed behind the case through Soloki and Dinaburg. After withdrawal of the Russian army on July 2, 1812 the group of the major general Ya. P. Kulnev received a task to be transported on the left coast and to conduct investigation for Dvina, and when approaching the French troops to pass for Dvina into Druye and to burn for itself the bridge. Ya. P. Kulnev sent the Grodno Hussars forward headed by the lieutenant colonel Ridiger who found the French group consisting of a horse egerskogo and hussar regiments of a division of Sebastiani near a front line. Ridiger suddenly attacked and crushed French who lost up to 300 people in this fight by the killed and wounded. The French brigade general Sen-Zhenye, 3 officers and 140 lower ranks were taken prisoner. Russians lost the killed 12 and wounded 63 persons. Kulnev's actions were so vigorous and resolute that Sebastiani who had 2 crews in 1800 horses determined Ya. P. Kulnev's strengths in 4000 people and receded on 10 versts. This fight was remarkable also the fact that it forced Napoleon to stop in Svintsinakh till July 5 as it took group of the major general Kulnev for vanguard of the Russian army which took the offensive. It gave some gain in time and improved matters of the Russian armies. Having collected the information about the opponent, Ya. P. Kulnev's group was transported back for Dvina. Reporting on successful fight, Ya. P. Kulnev did not attribute success to himself. In the report he asked: "If I deserve any requital, then I ask to award for special favor Ridiger instead of me". A message about successful fight of Ya. P. Kulnev, one of the first successful fights of the Russian army, and capture of the first French general made his name known to all Russia. Soon it was offered to case of the lieutenant general P.Ch. Wittgenstein to cover from the French army the direction to St. Petersburg. For investigation of forces and intentions of the opponent of columns P.Ch. Wittgenstein directed Ya. P. Kulnev with group of 4335 people. Ya. P. Kulnev crushed on July 13 several French groups, destroyed a wagon train, took prisoner 432 persons and among them the officer of the French General Staff from whom he received data on approach of French to Sebezh. Having learned about it, the Item X. Wittgenstein acted towards to French and on July 19 about the town of Klyastitsy gave them battle in which Ya. P. Kulnev took the most active part. French were forced to recede. Pursuing the enemy, Russians captured 900 prisoners and almost all wagon train of the marshal Oudinot. Next day - on July 20, 1812 the major general Ya. P. Kulnev died. A kernel to it tore off both legs over the knee and in a few minutes he died. His body was buried near Sivashino at a river Nishchi confluence in Dries, in places where he was born and grew. Also squeezed a sword in a hand. In 1832 the hero's ashes, on Nicholas I's command, were transported in Ilzenbergsky church in the Rezhitsky county of the Vitebsk province where there was its patrimonial ancestral lands. In 1824. The Grodno regiment was renamed in Klyastitsky the 6th hussar the general Kulnev a regiment, and Grodno was named the Grodno Hussars which are again created leyb-guards.